Pollution involves so many different factors from so many sources that there is no single or simple remedy. Pollution is an evil which has born out of development. Mankind will perish if the protection of the environment does not become an integral part of all technological development, Planning, and management. All planning and policies for development of appropriate environmental technologies for sustainable development have to be economically viable and socially acceptable. 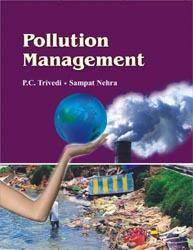 The present book “Pollution Management” incorporates critical articles on environmental pollution and its possible management strategies. There are 22 chapters covering articles on Some technologies on removal of nitrate from drinking water; Role of plants in the control of noise pollution; Hazardous issues of heavy metals to ecosystems and human health; Role of soil microorganisms in pollution management; Impact of pollution management; Impact of pollution on reproduction; Sustainable pollution management; Management of flyash using cyanobacteria; Anaerobic biodegradation process for wastewater treatment; Air pollution-environmental hazard. The book also covers topics like Education and environmental awareness; Pesticide in the environment; Air quality deterioration due to road traffic impact; Bacteriophages as biotools for monitoring faecal pollution; Bio-composting of pulp industrial biosludge; Cyanobacterial toxins-monitoring an management; relationship of weeds eith effect of industrial pollution; In vitro diesel oil bioremediation capacity of selected soil microorganisms; Impact of pollution on reproduction, etc. In a nutshell, this Book covers environmental pollution and related strategies that might lead to improved environment safe for the living of humans o n this globe. This book will definitely serve not only as an excellent reference material but also as a practical guide for the teachers, research workers, students and environmentalists.